Press the CD button twice or use the MODE button on your steering wheel to access the Xcarlink unit. If you have your iPod connected, the LCD will display EX1:66, otherwise it will display EX4, if the iPod is not connected, the XCarlink can still be used to input audio from an external device via a 3.5mm AUX cable. While the display reads EX1 (CD01), you will retain complete functionality of your iPod. Any playlist/album/artist selections should be made using the iPod user interface. Tracks can be changed via the steering wheel controls or the next/previous track buttons on the centre console. The fast forward and rewind buttons can also be also be used to seek within a single song. The timer on the LCD will not accurately reflect the position with a given song. Pressing DISC+/DISC- will put the XCarLink unit in "playlist mode." Each 'disc" references a different playlist. EX2 (CD02) represents the first playlist on your iPod. EX3 (CD03) represents the second playlist, and so on and so forth, up to EX6 (CD06), which represents the fifth playlist. The iPod screen will read "ok to disconnect" and the user interface can not be used. The numbers following EX2,EX3 etc. represent the track number within that playlist. For example, EX2:57 would mean that the XCarLink is currently playing the 57th song on the first playlist. If you have many songs on your playlist, the digits following the colon may flash between two different numbers. For example, if the 285th song on the playlist was being played, the digits would flash 2 followed by 85 since there are only two digits available. The repeat button can be used to repeat a single song. The random button can be used to play songs in a random order. If you change tracks while you are in random mode, the next track in the playlist will be selected and random mode will be cancelled. If you are in random mode and you would like to switch to another random song rather than the next song in the playlist, you should press the random button twice. Fast forward and rewind can be seek within a single song and the LCD timer will be updated to reflect your position within the song. You may change tracks by using the steering wheel controls or the seek buttons on the centre console. The random button can be used to play songs in a random order. If you change tracks while you are in random mode, the next track in the folder will be selected and random mode will be cancelled. If you are in random mode and you would like to switch to another random song rather than the next song in the playlist, you should press the random button twice. The operational instructions for the Xcarlink All in One interface is identical to that of the iPod interface and the USB interface. 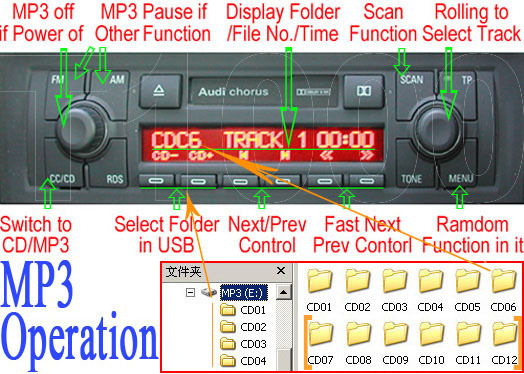 To switch between the different inputs, simply return to FM mode then back to CD changer mode. Each time this procedure is followed, it will switch from iPod to USB to SD. Press the CD button twice or use the MODE button on your steering wheel to access the Xcarlink unit. You will be prompted to pair your Bluetooth device with the interface. Enable the Bluetooth on your phone/tablet and select SCAN. Xcarlink should then appear in the menu. 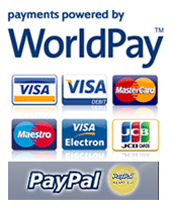 Select Xcarlink and enter '0000' as the passcode. Once the device is paired, select a music track and the audio will start to stream through your car radio. Use the next/previous track buttons on the radio or steering wheel controls to change track. To use the AUX input, change to Disc 2 and the AUX input will now be active. To return to Bluetooth streaming mode, select Disc 1.